Top Check Engine Light Causes - Why Is Check Engine Light On? Is your check engine light on? Then it is time to visit the auto repair shop. Sometimes when the light comes on, people want to avoid getting the car looked at because they’re afraid of an expensive repair bill. The problem is, the longer you put off that repair, the worse the damage can get and the more expensive your repair bill will end up being. You’ll need to get that check engine light turned off anyway, or your vehicle won’t be able to pass the Illinois vehicle emissions test. 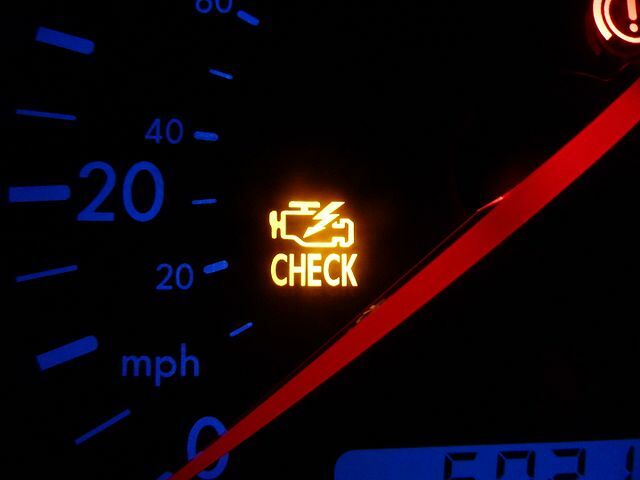 If your check engine light is on, it’s usually one of five most common reasons. We’ll expand that list a little further to cover the top ten most common causes of your engine light turning on. The chances are very high that one of the items on this list is causing your issue. How much will it cost to fix my check engine light issue? Gas Cap – A loose gas cap is one of the most common reasons why the check engine light turns on. Sometimes the cap will need to be replaced, but this won’t be an expensive fix. Will cost around $20. Oxygen Sensor – The oxygen sensor is the part that monitors unburned oxygen from the exhaust and how much fuel is burned. A faulty sensor means it’s not providing the right data to the computer and causes a decrease in gas mileage. This will cost on average around $200, but if it’s not fixed, it can harm the catalytic converter and then you’ll have a really expensive bill. Catalytic Converter – This is one of the most common issues and the list, and unfortunately, also the most expensive. It will cost in the range of $1,200 or more. We hope you’ll be able to get your engine checked before it damages the catalytic converter. Normally it will last the life of your car, unless you ignore other issues. Mass Airflow Sensor – The mass air flow sensor controls the flow of air coming into your car’s engine, which determines how much fuel to inject into the engine. An issue with it can hurt your fuel economy by 10%-25%. It will cost on average $350-$400. EVAP Purge Control Valve – This valve prevents vapors from the gas tank from being released into the atmosphere and channels them into a charcoal canister to be burned in the engine. Replacing it can cause $175-$200. EVAP Purge Solenoid – The solenoid is another part of the EVAP system that controls how much fuel vapor escapes into the atmosphere. It will wear out over time and it will cost around $200 to replace. Ignition Coils – Ignition coils are used to provide an ignition source for the fuel to combust in an engine. The average cost to replace ignition coils will be around $250. Thermostat – The thermostat is responsible for regulating the engine coolant temperature to warm and cool your vehicle. This may cost $200-$250 to replace. Need a mechanic you can trust?